Ok so I could be blogging about pets, food, the weather (hey gals it’s SNOWING and wild) and all the usual but I just have to tell you about the 10k charity run that Attila and I did on Sunday. When I say Did, we really did do it in style, came in at 56.36 minutes, can you believe it! I certainly couldn’t and promptly burst into girly tears. Mix gushing tears with over excitement, serious sweating and a very red face and you get a picture of feminine joy (not!) like no other!!! We were blessed by the weather thank goodness. Looking at the howling wind and sideways snow this morning I am SO glad the run was on Sunday and not today. 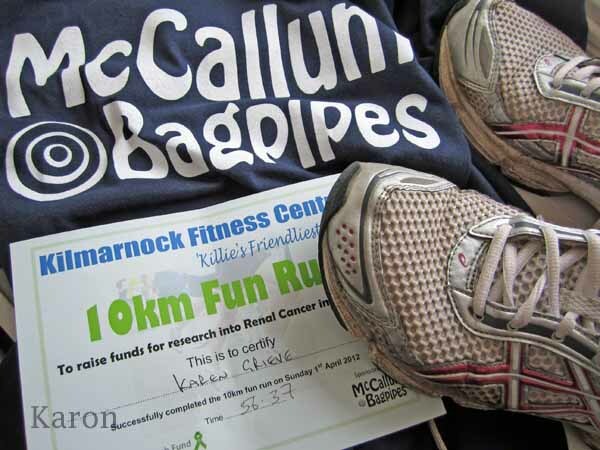 It was just a local race in Kilmarnock for a cancer charity. Only in Scotland could the sponsor’s T shirts feature bagpipes. But there you go, at least they were navy blue and not luminous orange or anything seriously unflattering. As ever I was floored by the number of hills in the area, the damn things just seemed to be going on forever, at one point I thought we were in the foothills of the Himalayas and should at least see an impressive snowy peak ahead instead of a less than inspiring housing estate. Still you get to see the area I guess. The first part of any run is always hard going, just getting the old bod into gear is hard enough. Every cell of mine was saying “Come on it’s Sunday, give it a rest, let’s head back to bed”, I squashed their persistent voices and carried on. The fact that the first half of the race was mostly uphill was a bit of a bummer and I have to admit to a few small whines (maybe whinettes) to Attila along the lines of “Can’t I just give up now”, “I wanna go home”, and that all time favourite “Are we THERE yet?”. They told us there would be water available at the half way point. It couldn’t come soon enough for me. Alas this was a small run and not the huge event in Glasgow that I took part in last year where there were whole teams of people at the sides of the road thrusting plastic water bottles on you to quench your thirst. Oh no, this was much more low key. Have you ever tried to run and drink out of a paper cup at one and the same time? I have dear reader and it ain’t easy. Sloshing water all over my face and down the bagpipe emblazoned T Shirt I think I managed about a mouthful before I tossed it into the nearest bin. As a refresher it was a bit of a non starter really, but hey the thought was there…..
Second part of run went better for me, there were less uphill struggles and I had found my stride (would have preferred to find someone like Linford Christie’s stride, but what the hell, mine proved good enough on the day) and it all seemed to come together a bit better. Attila was of course bounding along like bloody Skippy and hardly out of breath (remind me to find someone older and fatter than me to run with) but he did have the grace to slow his pace a bit now and then when he saw I was falling behind. The home straight came into view and the balloons of the finishing line looked like the pearly gates after the muscle cramping hell of the last few kilometres. I even managed to lengthen my stride to go over the line, something that was beyond me on the last charity run I did. When the timer called 56.36 minutes to me I was over the moon. I had wanted to do the run in under an hour and I’d done it. Attila was thrilled too, I know he could have done it much faster and got a better time for himself, all credit to him for matching my slower pace and keeping up the chat. So the trainers are in the wash and are having a couple of days off. The weather is certainly putting paid to any lunatic ideas of outdoor exercise anyway. I rest up and enjoy coffee and cake and feet up on the sofa for just a day or two at least. Well earned coffee and cake!